I still recommend that you see the film — for that killer first-half and for the brilliance of Balan. This might be a flawed franchise, but I’m looking forward to Kahaani 3. Kahaani 2 feels like a meal that begins with appetisers in a Michelin-star restaurant and ends with dessert in a dhaba. It's unsatisfying. A tale of justice redemption ! From a master story teller ! One of Vidya Balan’s best! A film NOT to be missed! 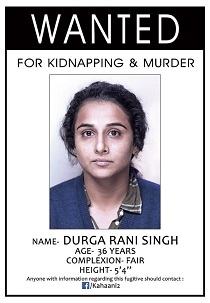 But for a film that builds up wonderfully, “Kahaani 2 – Durga Rani Singh” fails to finish off in style. Maybe we need another Ishqiya to bring her dark-black mojo back. Kahaani 2... is not a patch on Kahaani — in any which way, except for Vidya Balan. She is as brilliant and as solid as ever, this time as Durga Rani Singh. On the whole KAHAANI 2: DURGA RANI SINGH comes across as a dark thriller that addresses a sensitive subject backed with fantastic performances. Overall, ‘Kahaani 2’ is a complicatedly crafted film that becomes absolutely terrifying at times. It deserves a watch from fans of thriller movies. The music is strictly situational and one waits to see how it is incorporated in the film for better impact. The stunning narrative infusing more mystery and more drama in audience's wits is what Sujoy Ghosh is known for. I really wanted to see more of Inderjeet’s senior, a far more interesting loudmouth. To watch him solve this case would be spiritual cleansing. Ghosh throws in too much red herring bhaaja and, teasing twists that could have given us some final drama, shies away from a satisfying finish. Vidya Balan's Durga Rani Singh is a welcome addition to the increasingly visible pantheon of women who just won’t stay quiet in Bollywood. But if you're someone who hasn't seen the first installment, and thus, have little or no expectations from it, it might surprise you with its simple, clean shots and a fair script. ‘Kahaani 2’ may not be as impressive as its predecessor ‘Kahaani’, but the movie makes for an engaging watch and has the ability to give goosbumps. Vidya and Arjun's rock solid performances let down by a lethargic second half! Vidya is a fine actor, no doubt, but she doesn't surprise us with anything extraordinary. For a film that builds up wonderfully, 'Kahaani 2 ' Durga Rani Singh' fails to finish off in style. Vidya's filmy ride isn't the thrill show you signed up for! After the debacles of Ghanchakkar and Humari Adhuri Kahaani, Vidya Balan is back and how! The acting, the setting and the way it captures Kalimpong is great, but the ending, the humour, and the plot twists leave the audience wanting more. Decent Standalone Thriller, so Why Call It a Sequel? No doubt Kahaani broke new ground. As a rule franchise installments rarely meet the standards set by the first. Her fear, angst and protectiveness towards her daughter is beautifully captured. Vidya Balan and Arjun Rampal fail to keep you on the edge of your seat! She gets you every time she recoils from a man's touch, or reaches out to connect with a troubled six year old. Kahaani 2 comes across as a dark thriller that addresses a sensitive subject backed with fantastic performances. Vidya, shorn of make-up and glamour breezes through her dual role in autopilot mode. Arjun impresses as the cop hankering for a promotion and is believable as the husband. If you have an appetite for thrillers (albeit, with some flaws) give this one a try. What keeps you immersed in this film is the captivating story, tight plot-line and powerful performances. Vidya Balan owns this creepy, edgy thriller.